The Bazna is a pig originally from the Transylvania region of Romania, and they are in fact not vampires. 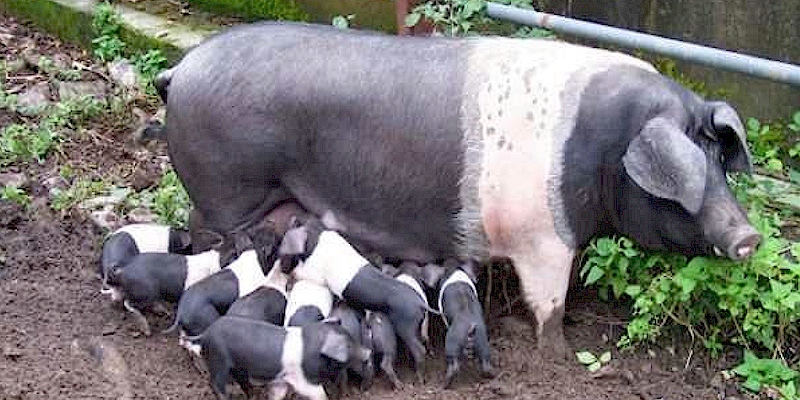 The Bazna pigs are black with a white belt, medium withers height and body structure, and typically weighing 125 to 135 kilograms by their first year. They are mainly bred for their lard and lean meat. The Bazna dates back to 1872, when they were created from crossing the Berkshire and Mangalitsa pig breeds. The offspring from that cross inherited the best traits from the Mangalitsa with their superior productive traits. The resulting hybrids were quickly spread around the neighboring towns in Transylvania. Over the next decade, Berk boars were imported from England and were used to improve the Bazna breed. From time to time Yorkshire and Sattelschwein breeds were also used to improve the Bazna breed. For the following 30 years the Bazna pigs continued to be improved by using the Wessex and Hampshire breeds to produce the most superior qualities from all of the crossbreeds. The Bazna breed was officially recognized in1958. Since then several select populations have been established. The Bazna pigs are strong and share bloodlines from some of the best breeds of pigs.